To be a successful investor you need to know three things: 1) What to buy, 2) When to buy, 3) When to sell. Generating instant answers to those three essential questions is what Stops and Targets does! 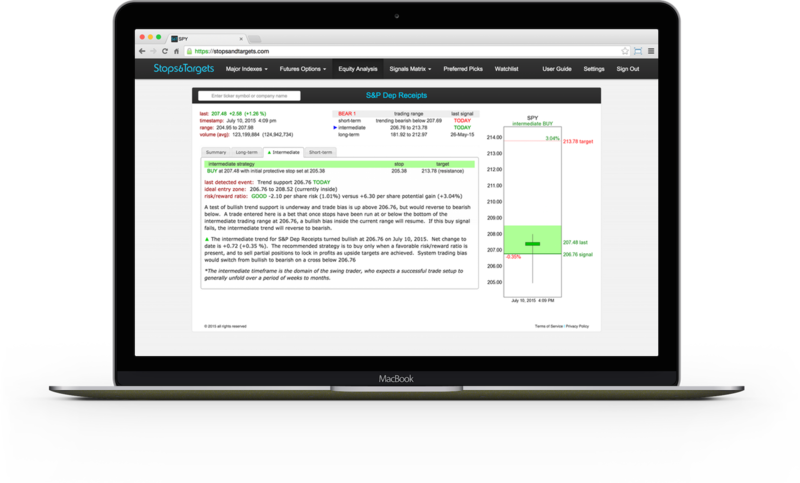 Providing real-time analysis and trading strategy suggestions, Stops and Targets helps you select new investments and then skillfully navigate through changing market conditions as you flawlessly manage your investment portfolio. To begin your Stops and Targets experience read our User Guide. You will quickly see how it all works and learn about Stops and Target's features and benefits. Then sign up for a free 14-day trial. You can use that time to get your current portfolio in shape and to find new investment opportunities as you test drive Stops and Targets. After the trial period, we add an additional 30-day complete satisfaction guarantee for new members. That’s how confident we are that you will love Stops and Targets and want to join our growing family of thriving investors who now average YEARS of continuous and uninterrupted membership! The vast majority of commercial trading systems are optimized for either one market type or the other. Unfortunately, great trend-following systems invariably get killed in rangebound markets and amazing trading range systems will always get run over in trending markets. Stops and Targets solves that problem by using clever, innovative and original algorithms to detect and instantly adjust strategy suggestions to fit the particular market conditions in real-time! Click here to start exploring Stops and Targets! 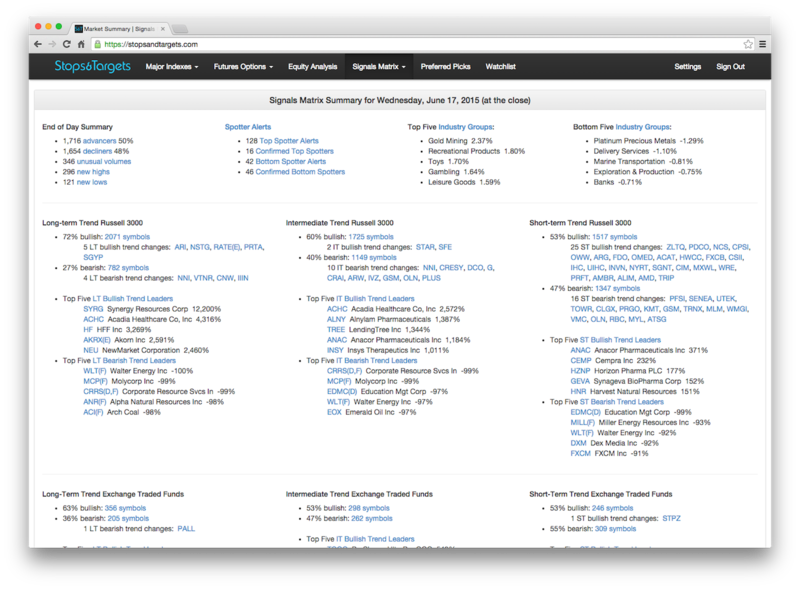 At a glance, you can quickly discern everything needed to trade successfully in real-time. 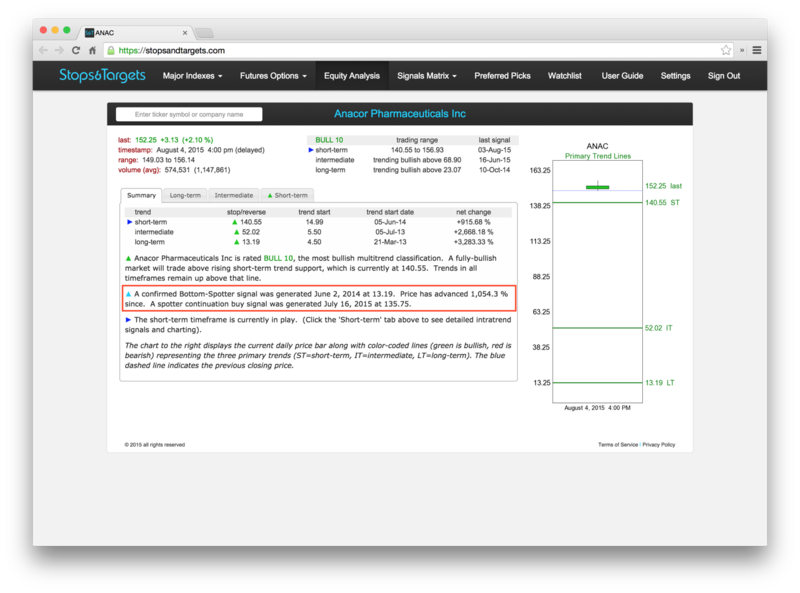 • Initial Protective Stop — to maintain a 3:1 gain-to-risk ratio (81.42 -1.92% in the example). Click here to enjoy 14 days of Stops and Targets 'on the house'. Spotter Signals are an exclusive algorithm developed by Stops and Targets to detect the exhaustion of a powerful trend. Think of Spotter Signals as your own ‘canary in the coal mine’ ... early warning signals that alert you to momentum weakness well before a potentially damaging reversal begins. Members watch for the unmistakable end-of-day signature of massive numbers of index, futures, and Russell 3000 Spotter Signals to identify the start of a significant pullback or major trend reversal on the very day it begins. *Stops and Targets’ Spotters Signals have detected every major turn in the broad market since their introduction in 2009. You will know when it is time to get out… long before the panicked ‘rush to the exits’ by others begin. 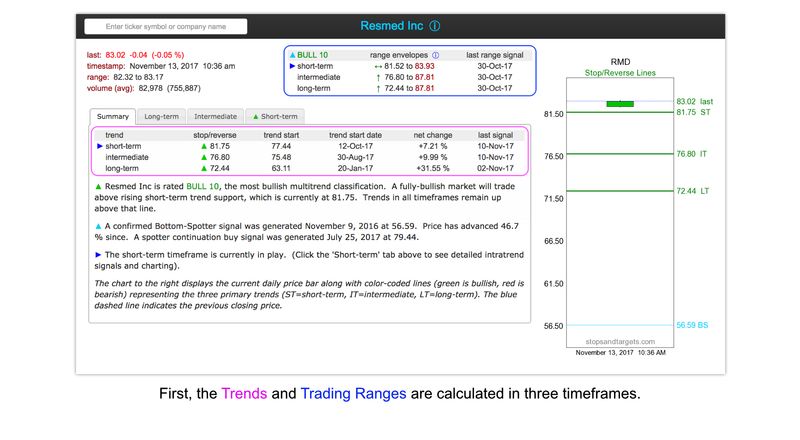 Spotter Signals are also a favorite stock-picking resource for short-term traders who specialize in counter-trend trading. 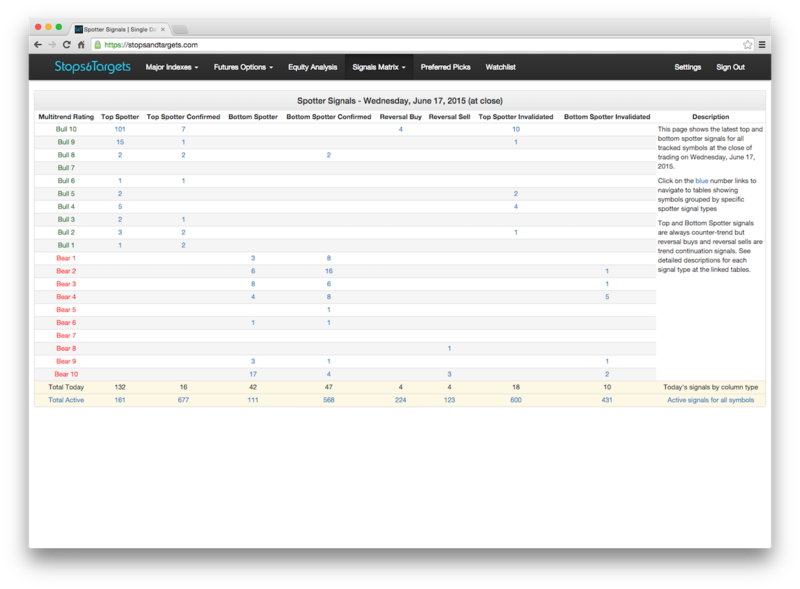 Start your free trial today to see the latest Spotter Signals. 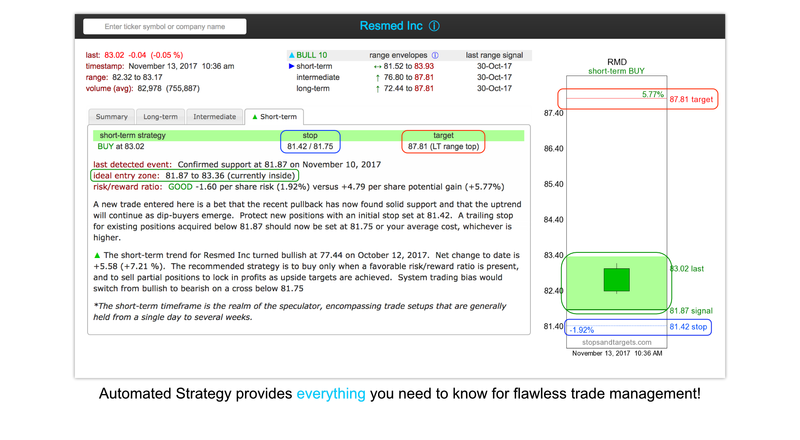 Stops and Targets provides real-time ratings and suggests sophisticated trading strategies for Major Market Indexes, select E-mini futures options, hundreds of Exchange Traded Funds, and every stock in the Russell 3000 (which covers 98% of the investible US market). 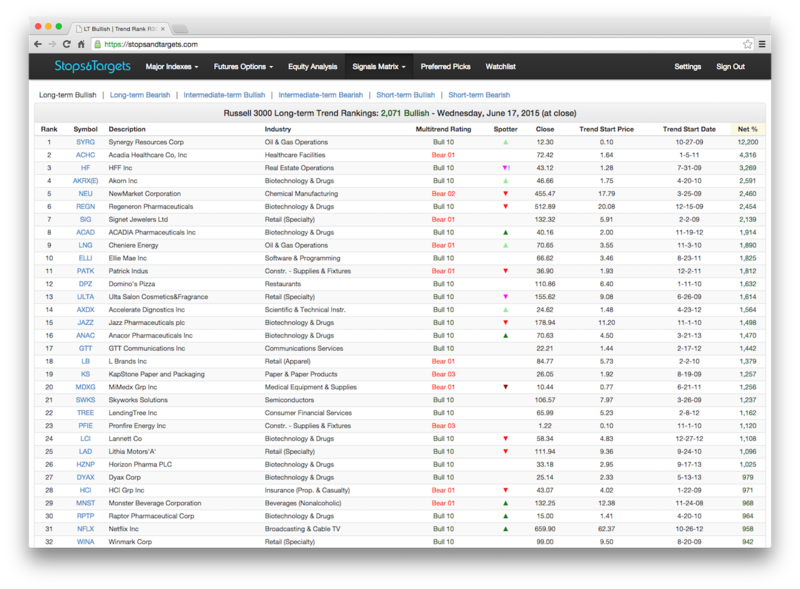 Evaluate your current portfolio with our free trial. 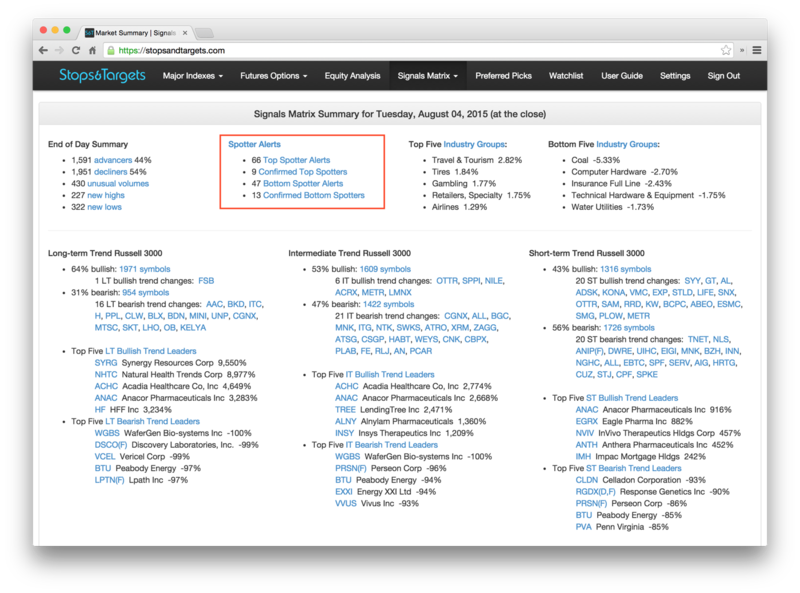 The Stops and Targets Market Summary provides a big-picture overview of the current health of the market. 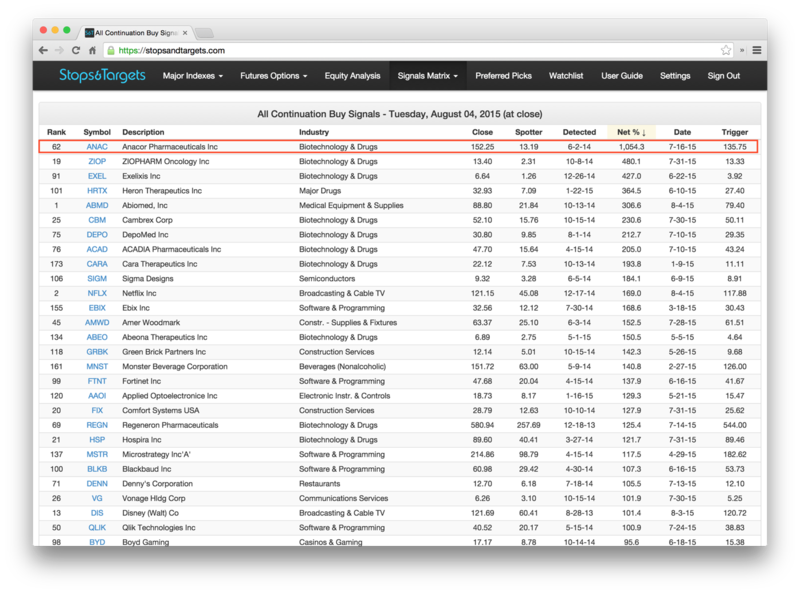 Optimized for efficiency, you'll be able to instantly and accurately gauge the day's trading activity and zero in on new opportunities. 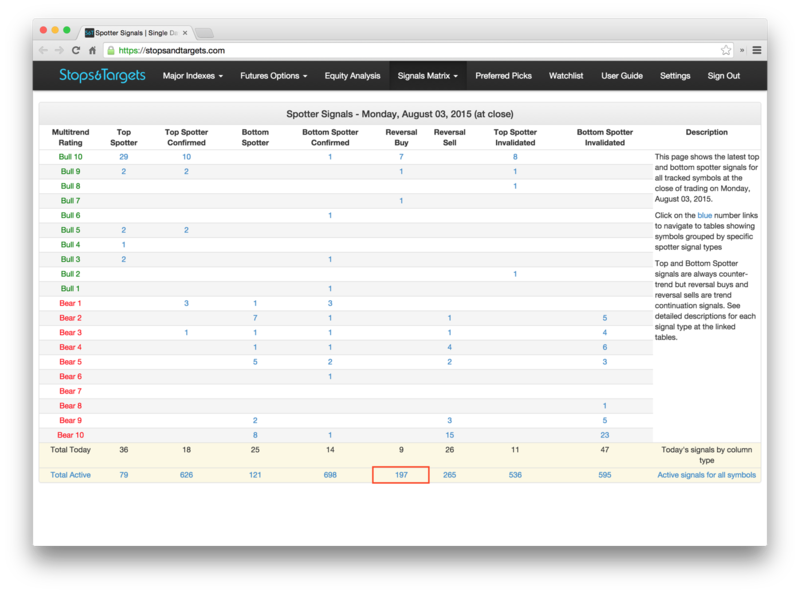 The Signals Matrix provides an easy way to drill down into precise details using dozens of linked reports. 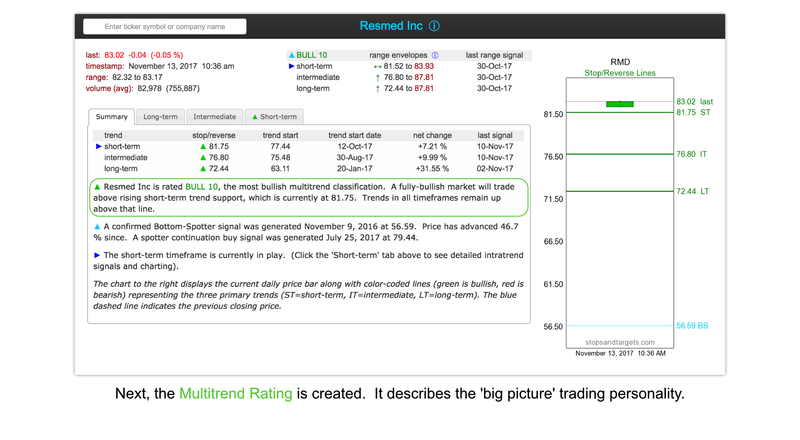 Find very specific types of trending and counter-trending buy and sell signals, discover new top and bottom spotter alerts, see trend leaders and laggards in multiple time frames, and much more. Explore the Signals Matrix to find new trading ideas. After the market closes each day and the Signals Matrix has been updated, Stops and Targets sends you a personalized email that shows alerts for new signals on all securities tracked on your Watchlist. A quick glance lets you know when your portfolio needs your attention. 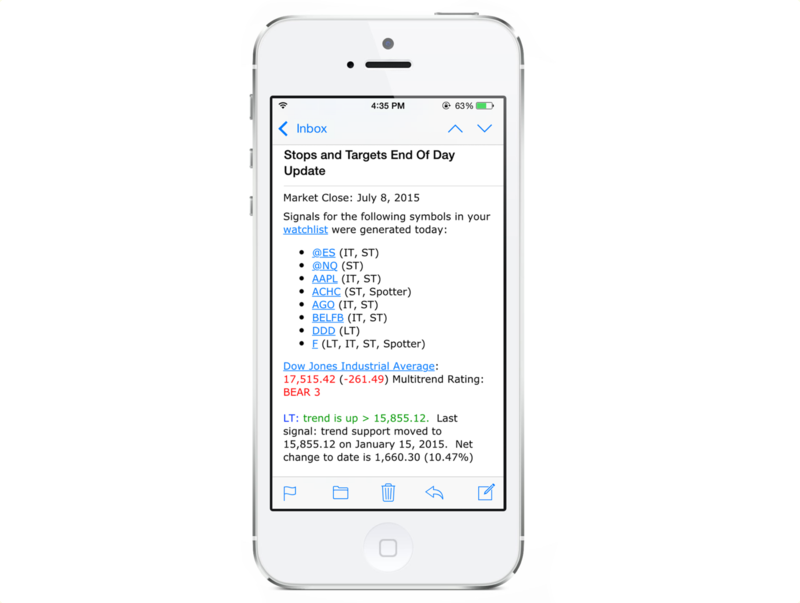 Let Stops and Targets watch the market for you! 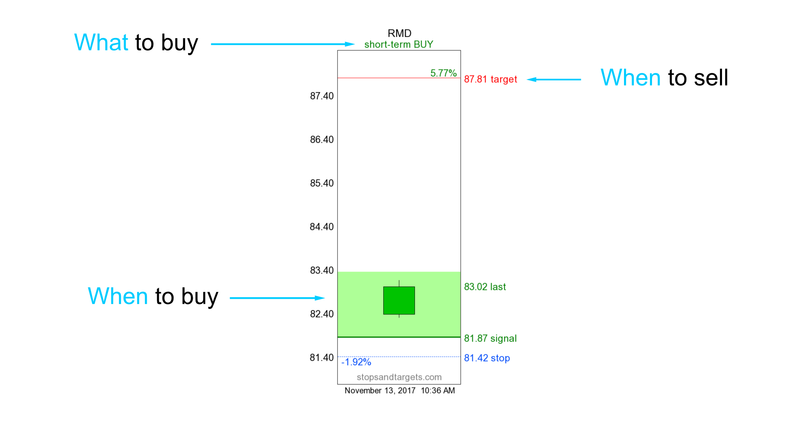 Each day at the market close, Stops and Targets generates a new list of buy and/or sell setups (depending on current market configuration) for the next trading session. Preferred Picks are always selected from among the strongest trending stocks and when large numbers reverse without recovery it can be an excellent harbinger of a potential major trend reversal for the broad market. The idea is to always buy the strongest stocks in a bullish market, and to sell the weakest stocks in a bearish market. 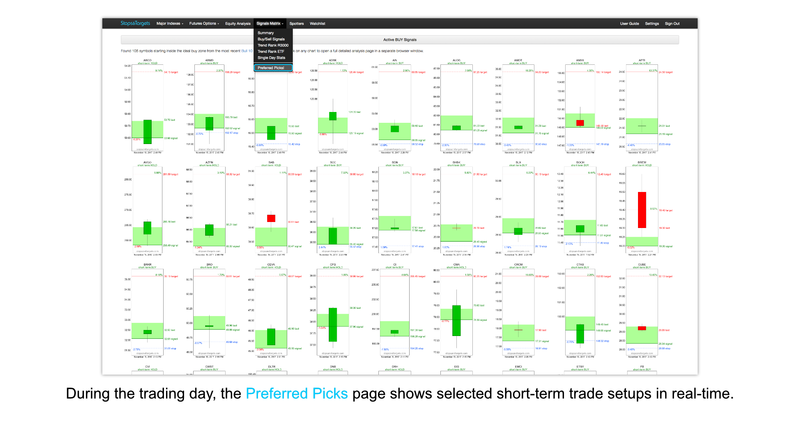 Click here to see today's Preferred Picks. You are one click away from knowing exactly what to buy, when to buy, and when to sell. Click the button above to get started!